Police on Saturday arrested Robert Kealon, age 24 of Sion Farm, and charged him with reckless endangerment after officers reported seeing him fire a handgun from a car. According to the V.I. Police Department report, officers on patrol in the vicinity of Miracle Mile in Golden Rock at 4:09 a.m. Saturday when they heard three shots discharged from a vehicle that was ahead of them on the roadway. The officers reported the situation to the 911 emergency call center by radio and followed the vehicle until it stopped along the road near the Five Corners Intersection in the Princess Area. Officers then saw one of the occupants of the vehicle, a green 2000 Honda Civic, toss a firearm out of the vehicle in the immediate area. The officers were able to retrieve the firearm and took the three occupants of the vehicle to the police station for questioning. 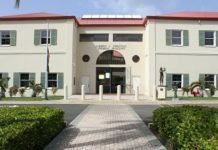 One of the vehicle’s occupants, Robert Kealon, age 24 of Sion Farm, admitted to having a license for the firearm and discharging the shots from the vehicle. He was then arrested and charged with reckless endangerment first degree. Bail was set at $10,000. Unable to post bail, Kealon was remanded to the Golden Grove Correctional Facility pending an advise of rights hearing.